Having fun without engaging in unhealthy or destructive activities is part of the recovery process. 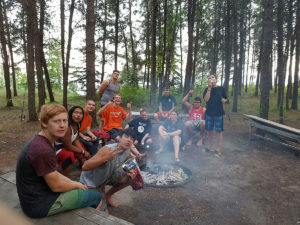 One of the joys of this ministry is seeing teens find pleasure again in simple things like a trampoline, baseball, playing fetch with the dog, and outings like our annual canoe camp. 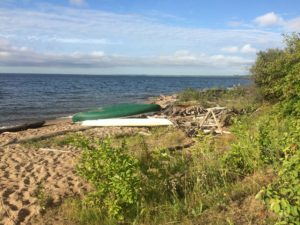 This year, from July 17 to July 22 we will take all of our students on a canoe trip. We’ll load the gear into the vans for an eight-hour ride to northern Saskatchewan. 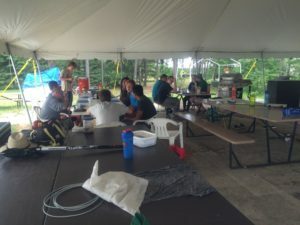 Our destination is Wilderness Ministries Bible Camp on beautiful Tobin Lake, a campsite dedicated to Christian ministry. We’ll sleep in cabins, fish for some of our meals, roast hot dogs and marshmallows, and fight the elements. We’ll enjoy canoeing, swimming, hiking, volleyball, and games. The students will all take turns helping with meal prep and clean-up. An outing like this will require lots of teamwork and sharing. Canoe camp is a valuable learning experience. Surrounded by wilderness, we are brought face-to-face with the wonders of God’s marvelous creation. The vast forest and sparkling lake provide the perfect backdrop for our students to connect with God and with each other. The relaxed schedule offers time for extra one-on-one mentoring and impromptu discussions of God’s Word and our place in His plan. Nightly campfires are the setting for testimonies, singing, and devotions. Some of our deepest relationships and most lasting memories are made during our canoe camp week. The cost for this trip is $3,300.00, which is not very expensive when you consider that it’s for 16 people. But with July and August being our most difficult months financially, your financial assistance would be greatly appreciated, helping us give this once-in-a-lifetime opportunity to our boys.